The simple concept of hand-to-hand combat has been used to make many games, and this flash game serves as another valuable addition to the fighting game genre. 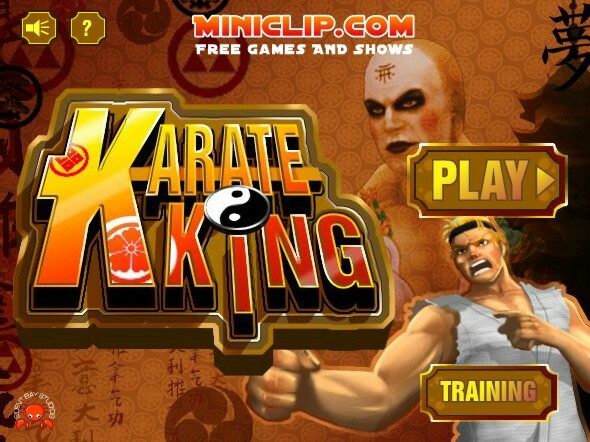 Karate King is very similar to games like Saloon Brawl, both of which were created by Miniclip.com, and this martial arts flash game challenges players to keep up with the pace that each level sets with agile enemies pursuing the main character. Though he has no deep backstory, the main character of Karate King looks like a cross between Ken from Street Fighter and one of the Cobra Kai students in The Karate Kid movies. Progression through each level in Karate King is very similar to that of Saloon Brawl as you will have a time limit of 5 minutes to defeat every enemy that shows up in a level, and in some levels a big boss, who is literally a giant in comparison to the player’s character, will appear. This big boss takes much more hits than a standard enemy. In most levels you will be pitted against ninjas and enemies who love to throw knives. The ninjas look similar to Ryu Hayabusa, the protagonist in Ninja Gaiden while the knife-throwing enemies look very similar to Raiden from Mortal Kombat. The 3D graphics presented in this game remind players of the Old School Playstation 1 graphics, but these graphics are implemented in a good way. Though this is a good game, what would have made Karate King better would be if there was more variety in the level design. From level to level it felt like the game was just switching back and forth between the setting of a karate training dojo and the Downtown setting of a Japanese town. 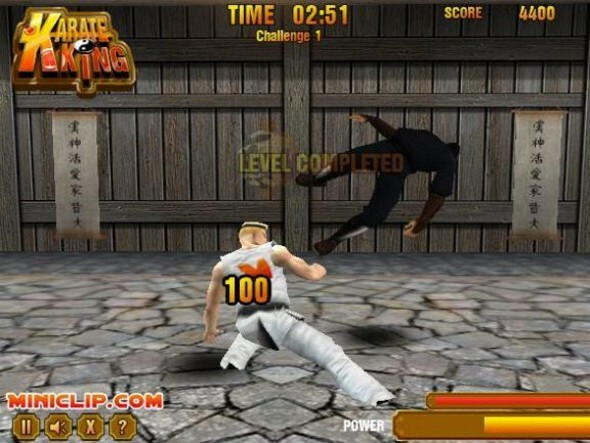 The game mechanics in Karate King are also very similar to the Saloon Brawl games as you will get to move around using the up, down, left and right arrow keys while you press the Z key to block any strikes, the X key to dish out a variety of karate moves, and the C key to either grab foes or pick up objects. When the player’s character has completely filled up his Rage Bar, then that becomes the perfect time to unleash his special move against the ninjas and the knife-throwing bad guys. This special move is a whirling roundhouse kick that damages any enemy that is within its range. 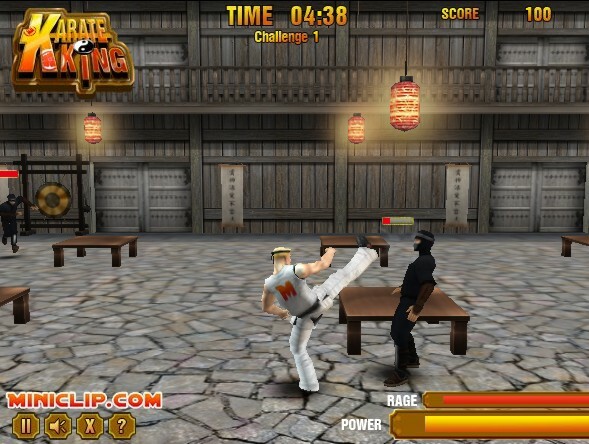 The basic karate moves players can use in Karate King include spin kicks, punches, chops, elbow strikes and leg sweeps. These moves alternate depending on how long players can keep striking combos going. For every enemy that is defeated and every gem, which is shaped like a typical diamond, that is collected players will be rewarded 100 points. Overall if you are already a fan of flash games like the Saloon Brawl series, then most likely you will enjoy playing Karate King as well. One thing to note would be the sound effects and music give this game the feeling of a comedic action movie. The music sounds serious like you are in the middle of a Bruce Lee adventure while the cartoony sound effects makes the experience feel like a slapstick comedy. The game mechanics respond very well and you never feel lost as all levels will keep you in a box as the enemies will come to you. If you are looking for a quick challenge in the fighting game genre then Karate King is worth playing.